February is one of my favorite months for celebrating. 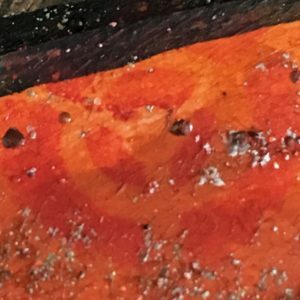 There’s Groundhog Day (Very low cost), Valentine’s Day (What’s not to love about a celebration of Love?) and Chinese New Year which gives me another excuse to eat good food. But my personal favorite is Setsubun. Odd that, but so it is. I first learned of the celebration while living in Japan I must admit to having been mystified. Really knowing when the New Year happens in Japan is tricky. Japan celebrates O-Shogatsu (New Year) by the Western calendar these days, but it was not always so. 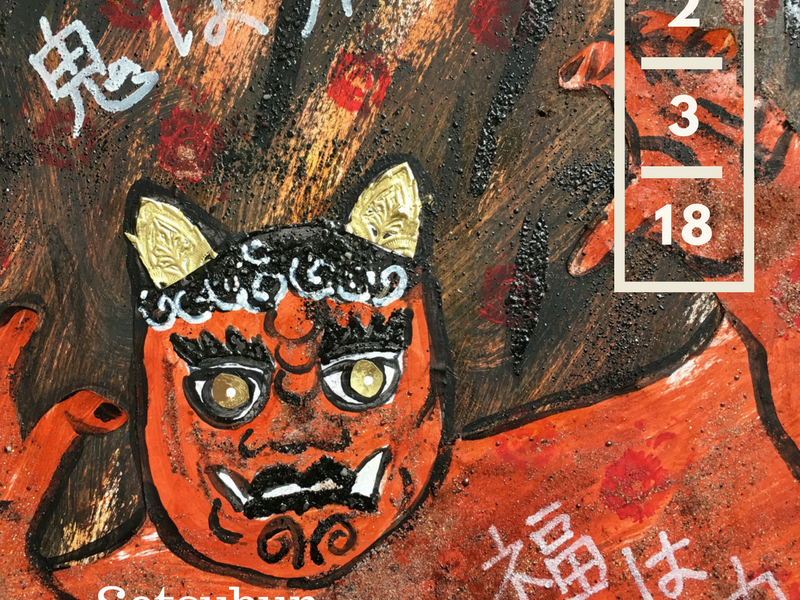 Chinese New Year still goes by the lunar calendar and Setsubun is set for February 3rd, though it is based on the lunar calendar as well. Let’s just say that Setsubun was part of the ritual of sweeping away the old year and moving into Spring. Literally, the new year is referred to as shinharu or new spring. Who can’t get behind a holiday that aims to sweep away the bad energy of the previous year, especially when that year was 2017? 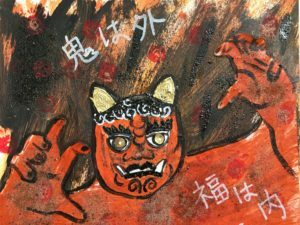 The spring festival is accompanied by mamemaki, a custom in which soybeans are thrown at people dressed in Oni (demon) costumes while chanting “Oni wa soto, fuku wa uchi” (Outside with the demon, fortune to our home). It is great fun to throw soybeans at the dressed up person and make them leave the premises. Nothing compares to seeing a four-year-old armed with soybeans take on the terrifying oni. 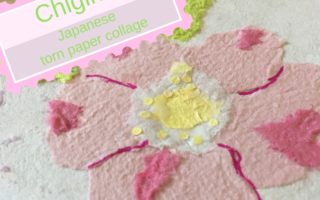 I decided that a Setsubun themed page would be just the thing to try out Seth Apter’s new line of Baked Texture embossing powders from Emerald Creek. Gwen Lafleur has them in her shop and I snapped up two of the colors – Chunky Rust and Rocky Road. Let’s just say I’ll be ordering the other colors. 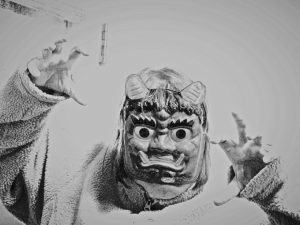 I started with this picture taken on a Setsubun years ago. It got taken through a number of photo editing apps to get the outline just right. I traced important bits with a black sharpie. Turned it over. Viola! Ready to paste down. The image was painted with orange. Oni are usually green or orange/red. I chose orange as it would go nicely with the embossing powder I chose. 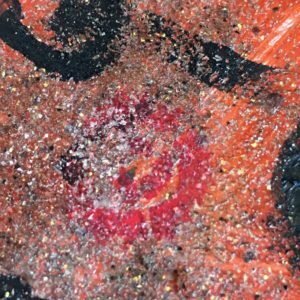 While the paint was wet I sprinkled embossing powder on the surface and hit it with a heat gun. Onis are often depicted against a night background. Often with fire. They come at night to wreak their havoc. So I threw down a background of yellow and added orangish strokes going up like the world on fire. Then the black paint was added to create a night feeling. While still wet I added the Rocky Road Baked Texture embossing powder and hit with a heat gun. What fun it was to see it melt! It really brought the feeling of charcoal, pitch and fire to life. 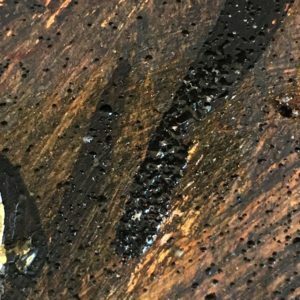 The oni attack started to feel real to me. The image was attached with gel medium. Black paint was used for definition of eyebrows, hair, lips and beard. Adding more embossing powder to these areas brought them to life. I especially love the oni’s curls which were later enhanced with white paint pen to bring out the definition of his curls. Dresden trim was used for his horns and eyes. To give the feeling of bean throwing, Gwen’s Decorative 6 Petal Flower Screen stencil from Stencil Girl Products was used. 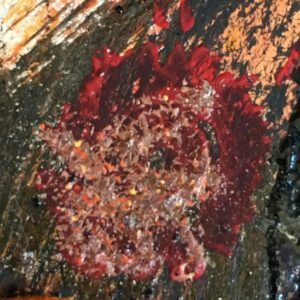 With red paint, the center of the flower was sponged randomly to show where the beans flew, exploded and ultimately repulsed the oni attack. Finally a white paint pen was used to write Oni wa soto, Fuku wa uchi. As the white pen covered the embossed area, the texture comes through the characters. Swoon! Just love that texture. 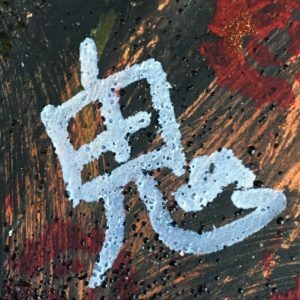 Looking for some good luck? Well, here you have some. 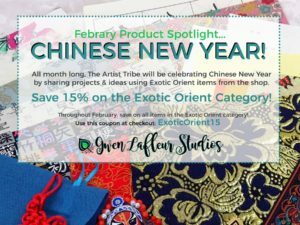 Gwen is having a Chinese New Year Sale and you are invited! That’s it for now. If you are looking for me today I’ll be throwing beans and driving away the bad vibes from the past year. Here’s to a 2018 full of prosperity in my home and yours. Linda what a showcase of a post! 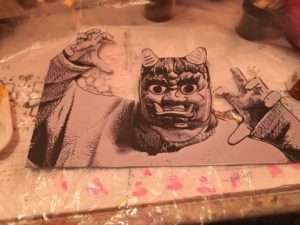 I love the history behind the Oni that you shared as well as the little bit about the 4 yr old- how sweet! What a gorgeous(?) Oni? So clever to use the Dresden the way you did and the embossing powders and have taken on a life of their own here!! What a fabulous job for your first time out with these treasures~ would not have known!! And I love the picture of you dressed up! heehee Adorable! Sending the same wishes for you in 2018! Jackie, so glad you came by to chase away the demons. Frankly with all the brightness you bring to the world I’m sure no oni would have a chance. I’m glad you enjoyed learning about Setsubun. I’ve enjoyed it so much watching my daughter throwing beans over the years. As a four year old it is so adorable. Now it’s a great stress relief. Any way around it, out with the bad from last year and new prosperity to you. 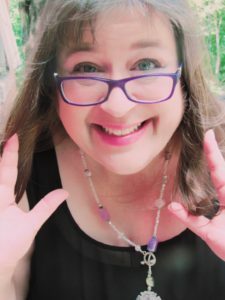 Lynda, this is such and exciting piece and I learned soooo much. I really enjoyed learning about new customs. The textures that you created really add a lot. So now I’m off to find some soy beans to chase a few of my own Setsubuns away…. So glad you enjoyed learning about Setsubun. 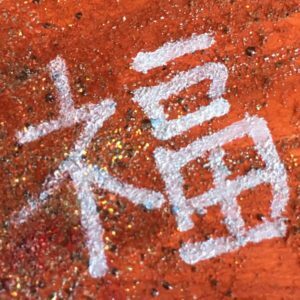 The embossing powder was really perfect for creating that oni onslaught. If you really are looking for soybeans, I forgot to add that the custom is to eat the number of soybeans of your age. One of the advantages of being older! I find salted soybean snack foods in my local grocery store. Usually black soy beans. They are tasty. So hope you will have fun chasing away the oni. Wow, not only have you educated me about the holiday and traditions, but you created an amazing piece of art! Linda, I’m glad you found the post informative. Thanks for the compliment about the piece. Thinking the color scheme goes along with your rust passion. 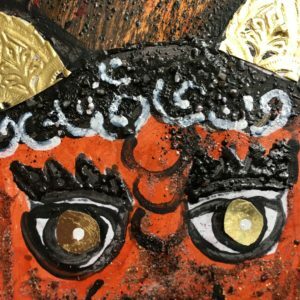 This is so cool Lynda – Setsubun is a celebration I really knew nothing about, so it was fun to learn more and at the same time, to see how this gorgeous piece was created! Thanks so much! I’m glad you enjoyed learning about Setsubun. It is so much fun. We had a blast last night throwing beans and sweeping away the bad vibes of the year. I loved using Seth Apter’s Baked Textures on this piece. They gave just the right amount of tar and terror to the oni. Now I can’t wait to try out the other colors as I know they all have different effects. Loved reading this and you made one fine Oni! I too really melted about the 4 year old throwing soybeans at the ferocious monster! 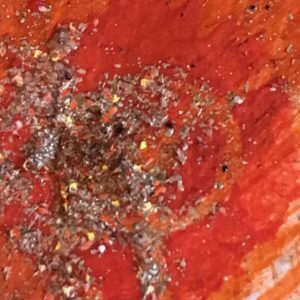 I love all the divine textures and colors you used and especially the embossing powders! I’m so glad, Sandee! 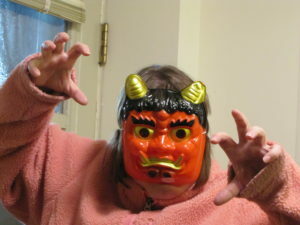 I do make a formidable oni! 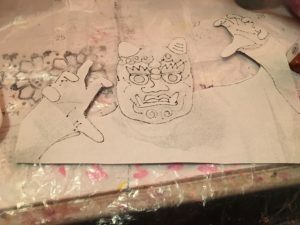 This year my daughter, who loves stage makeup, did her interpretation of the oni so I spent my whole time throwing beans. It was fun! I never forget the images of her over the years throwing beans and, usually, laughing. It was a different post, for sure, but I enjoyed doing it. 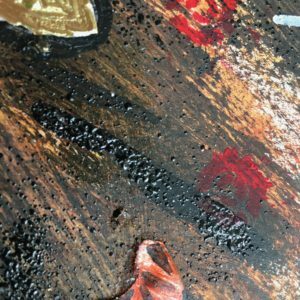 The Baked Texture was perfect for this piece. Looking forward to trying it out in different ways.